We here at Onely slaved, slaved, slaved over our essay The High Price of Being Single. We did a bunch of math. Over Skype. Some tears were shed, some fists shaken, but we got a decent draft together. Then we slaved over marketing it. We received a pile of rejections. Except unfortunately most were electronic rejection letters, so we couldn’t pin them to the wall like Stephen King did with his Carrie rejections, but rather we had to file them away in a sad little cyber folder. 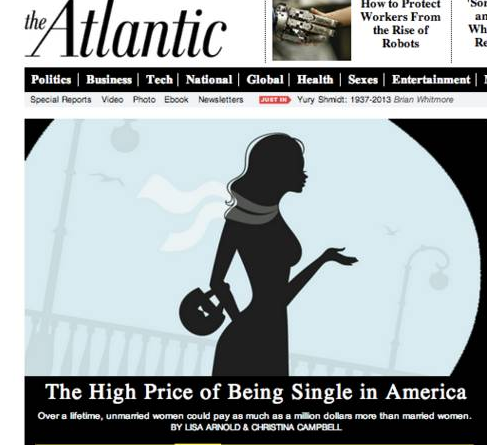 So now we really want to thank The Atlantic’s Sexes section for believing in our mission and publishing our ravings. As a result, many more people are now aware of the problem of marital status discrimination. We also want to thank the over 7,000 Atlantic readers who Liked the article on their Facebook pages, and everyone who added us to their Twitter feeds. We also thank all the other websites (ten pages of Google hits) who flagged the article for their readers. We thank everyone who took time to comment on the article, even the haters, because you’re bringing to life a dialog that should have been going on long, long before this. You do care after all! You really, really care! You get it! We love you all! I read about your research on Yahoo!News. I find this very interesting. Of late I have thought more about how being single/unmarried has affected me financially. I started to think about it more when the title for my new home (my first, bought completely on my own) stated in bold, capital letters “SINGLE UNMARRIED WOMAN.” I thought about it more when shopping the other day to buy a birthday gift for a friend. I realized that when I am friends with a couple, I buy two Christmas gifts, two birthday gifts, etc. etc. They tend to gift as a couple. Petty? Perhaps, but in time it does add up. That’s actually a really great point, something I didn’t think about. For both my brother, my sister, and their two significant others, I purchased a Christmas gift, so 4 gifts. I received one “mutual” gift from each couple. And that’s just the way it’s been. I have often thought of the higher cost of my living singly. I have to do everything on my own, pay for everything on my own, and have thought of all of the tax breaks for married people and people with children. I am so happy that this is not just my thinking but it is now being validated and beginning to be discussed. Two Adults (same age range) $78 divide by 2 = $39 each….a $15 price break each!! The YMCA clearly has some recognition of this bias because the “Two Adults” definition only came about a few years ago. It used to be “Married Couple”. So, it’s an improvement that any two adults can join and save some money over a single membership. BUT, it is still putting the larger financial burden on the single person. The member couples that I know at the Y are both there working-out regularly. So, that is FAR TOO BIG a price break, in my opinion. We single people are subsidizing the couples and families. A Family membership is only $6.00 more per month than Two Adults. Yes, you read that right! So, over the dozen years that I have been a member, I have paid a total of $2160 more than if I had been married or found another person to join (and stay joined) with me. Seriously? As I stated, this is but one example of the single bias. Thanks Anne. Also I notice that it says “Two adults–same age range” which is problematic on its own level (could conceivably be a way to favor couples–or maybe I’m paranoid). At the very least it’s agist. Oh my, perhaps you are paranoid. No ageism involved. My text above: Two Adults (same age range)- means the same age range as the Adult range listed above it. Which I specified so as to make an apples to apples comparison. Oh my goodness, I’ve raged for years against the discrimination in my own place of work regarding medical insurance where singles subsidize the cost of insurance for married couples/families but had no idea that practices such as that could cost us so much. Sadly, I do not have much hope that this discrimination will change much in the future but am excited that there are others who feel the same as I. Thank you so much for bringing this issue forward! Because this article repeats the silly, “women earn 78 cents for every man,” I will not endorse it, nor like it on FB. Repeating a fallacious statement ad infinitum only makes it true to those who want it to be true. This is why we need a flat tax rate, so everyone pays a percentage and there are no deductions for marital, parental, etc. status.